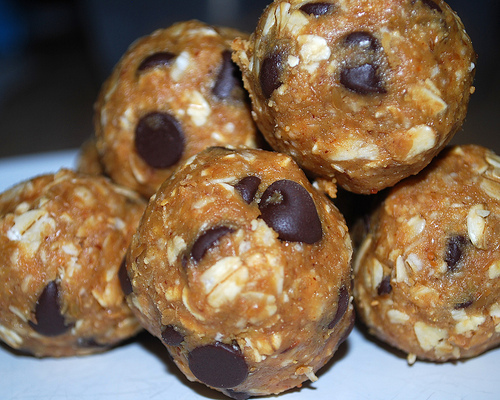 Last week we made the snack that kept on giving, tiny little peanut butter chocolate chip energy bites that lasted us the whole week. I made them Sunday night and they lasted for school snacks, mid morning snacks, afternoon snacks and recovery snacks. Yes, they’re balls. And I can’t help saying it. And if I’m not saying it out loud, I’m saying it in my head. I’m immature. I already know. It reminds me of Schweddy Balls. Yes also it’s a Pinterest find, I pretty much find and make Pinterest recipes like I’m getting paid for it. So here’s the recipe! And as you’ll notice, you can take so many liberties with it, it’s crazy! So go ahead, get creative! I’d love to see the balls you come up with! Don’t my balls look good? Sorry. Mix all the ingredients in a large bowl and refrigerate for 30 minutes. Then, form into balls whatever size you like. The recipe called for 2/3 cup toasted coconut flakes, so feel free to add that (we will, we just didn’t this time.) Things we will also add one day (but are not limited to) dried cranberries, almonds, agave nectar, other yet unnamed dried fruit. Keep them sealed tightly in a container in the fridge and take them out as needed! We LOVED THEM.